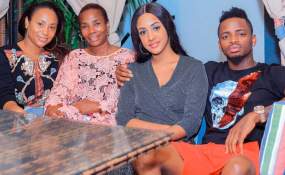 Diamond Platnumz (right), his mother, Sanura Sandra Kassim (second left) and his new girlfriend Tanasha Donna (second right). Tanzanian artiste Diamond Platnumz's latest catch Tanasha Donna has been received differently by the singer's family members. Since her New Year introduction, Tanasha's photos have been shared widely by Diamond's mother Sandra and sister Esma. Esma, in a media interview, confessed her love for her brother's new catch saying she wished the two had met a long time ago. "Huwezi amini Tanasha tayari ameshakaa ndani ya moyo wangu, nampenda sana na kuna muda najiuliza alikuwa wapi muda wote? Kwa nini hakutokea mapema kwenye familia yetu? Hayo mambo ya kuniita Yuda hata siyajali kabisa, watajua wenyewe kwani mimi maisha yanasonga," she said. Esma has been accused of being a betrayer as she was a close friend to Diamond's ex-girlfriend Hamisa Mobetto to the point of wearing matching deras during Mama Sandra's birthday. Diamond's half sister Queen Darleen has now been roped into the family drama after a comment she made during a media interview regarding Tanasha. Queen had been asked why she was missing in action during Tanasha's introduction and she responded by saying that she had already met her during the Wasafi Festivals. "Kwani Tanasha si mtu tu kama walivyo watu wengine? Kwa nini tungandanegandane? Si nilishamuona kule Kenya?" she questioned. Queen has in the past been reported to be the only family member who still has a soft spot for Diamond's baby mama Zari Hassan.